The wizard Calen lives in a remote part of a strange and magical land where he works day and night to improve his magical abilities. One day he tried to perfect a new recipe for a magical potion. But the day was long and tiring and he was so exhausted that he accidentally mixed the wrong ingredient into the potion. You can guess what happened next: his entire laboratory was destroyed in a huge explosion. But Calen is a very ambitious wizard — he quickly recovered from the shock and set off on a quest to rebuild his laboratory. His journey in search of new equipment and ingredients will carry him to beautiful, mysterious places. It’s not easy, though: mean little gnomes keep trying to stop him in more than 100 exciting match-3 levels — are you up to the challenge? A lovingly-drawn game that’s fun for young and old alike! 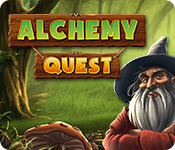 Alchemy Quest is rated 2.5 out of 5 by 21. Rated 2 out of 5 by coolmom4 from Boring I love M3 games, but the graphics were terrible, the music annoying. When you go to switch pieces, it is slow. I will not be buying tis game and uninstalled it after 10 minutes of play. Rated 2 out of 5 by myyorkies1994 from For the Younger or Newer M3 Players I have to agree with the majority. This game includes a lot of matching with little purpose. The icons are counted in each game to earn toward power ups, but the price of the power ups is so ridiculously high you would nearly be through the entire game before you had enough points to buy them. Doubled tiles, chains, double chains and blocks add to the M3 difficulty, but that's about all there is to this game. I did like that the icons change frequently, so you're seemingly playing different game boards. The slow movement and 'clunk' sound of the moving tiles isn't an advantage, although you CAN make matches while a prior match is still in motion...a point I require in any game I'll purchase. I love Victorian music, but the music loop in this game is too short and thus, repetitive. Younger players or those new to M3, who need to hone their skills, may enjoy this game. Rated 2 out of 5 by Cherubabies from Don't Waste your Time on this one ... BORING ... I don't understand how anyone can give this Game 5 Full Stars for Rating and 5 Stars for Fun, Quality, Challenge and Storyline! NO WAY! The icons were very BASIC, nothing spectacular. The music is annoying so I turned it off, and the "clanging" sound of the falling tiles was enough so I finally couldn't take it any more and I uninstalled the whole thing! I couldn't play this Game even if it was Free! Rated 2 out of 5 by GEmory from Irritated by game The music was very repetitive, and I ended up turning it off. The side games made me dizzy because of the wiggling screen. The storyline left me confused because it gave me the impression that I would be restoring the lab. However, it appears that any restoring is going on behind the scenes and is just implied. The game play is good and I actually liked the game at first, but then I got extremely irritated by how slow it was to gain items to purchase power ups. I was on level 18 when the hour was up, and wasn't even close to being able to purchase the cheapest power up. Rated 2 out of 5 by tacomataz from Not Much Fun I love to play match 3 games but this one just did not float my boat. One reason is it took to long before you could "buy" any upgrades. The matching part of the game was ok and the graphics were ok. The music I thought was good. I know that there will some out there that will love this game and that is fine but as for me I think I will pass this one by. Rated 2 out of 5 by shihtzumum from Made me cross-eyed I have been waiting for a great, fun, Match 3 and was hoping finally it was being offered. But, another disappointment! Why do developers try to get everything on a single screen so the items are so small and makes you go cross-eyed trying to find matches. The good Match 3s have big boards that you have to scroll to other sections and the squares are nice sized. Maybe I would have enjoyed this if they had spread the game table over several screens, but this one didn't and is a loser in my eyes. 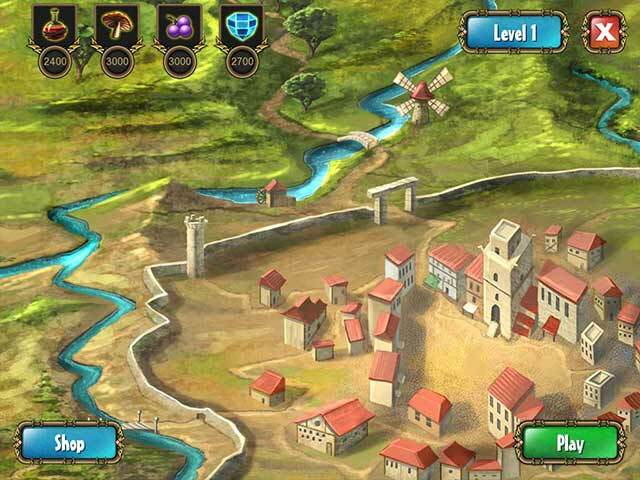 BF, I hope you hear my plea and find a developer who makes an exciting Match 3 that has huge boards you need to scroll the vast game board. 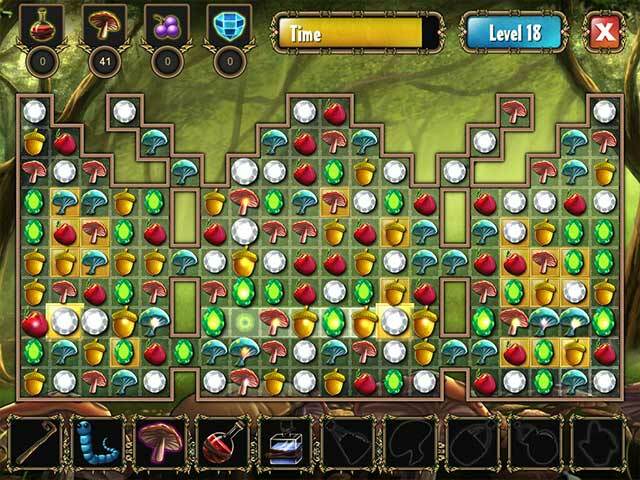 Example of board setup is Jewel Quest IV or 4 Elements. Rated 2 out of 5 by donadriedger from Too clunky Sorry, but I just don't like it. To start with, the cursor action is way too slow and sluggish. That is the first thing I look at when playing M3 games. When it feels like you're trying to run in deep sand, forget it! Included with this game is a really short-looped irritating musical backdrop and tiny symbols to try and match. You are supposed to be able to buy power ups and so forth, but the whole time I was playing the demo, I did not get enough of each jewel to even come close to buying anything. You need thousands of gems and I had about 30 of each. I played on relaxed mode, which I always do now for M3s, as I don't like the stress of timed play. Probably, if you play on the timed mode you would earn more points, but still...why have a relaxed mode if you can never get anywhere? There are way better M3s out there. I don't recommend wasting your time on this one. Rated 1 out of 5 by planetankh from Very Boring Nothing appealing about this game at all. No creativity or effort by makers. Nothing new. No challenge. Annoying music. Cheesey graphics. Quit after a few dull levels. Rated 1 out of 5 by TheMunn from Stick a pencil in your ear. It would be more fun. What a total waste of time, unlike other M3 games that difficulty increases with advancement, there is none of that in this game. I agree with fellow gamers, this could have been good, but no. Two thumbs down. Rated 1 out of 5 by DiDi212 from Really? Based on 15 minutes of the demo. I just couldn't stand another minute! The music, which I failed to turn down, was nerve wracking--a little goes a long way. The story line -- well maybe I didn't stick around long enough, but nothing -- and I really don't expect one in a M3 game. You accumulate points for certain tiles so you can buy things at the store, but I could tell it would be a very long time before I could afford anything. Hey, throw a bone in the beginning to keep a client interested. What finally did it for me was having to hit gnomes that popped up. I don't like the "whack-the-anything" game. Play the demo and read a few reviews. This seems like something from years past. Nothing new or inviting about this game for me. An explosion destroyed your magical alchemy laboratory! 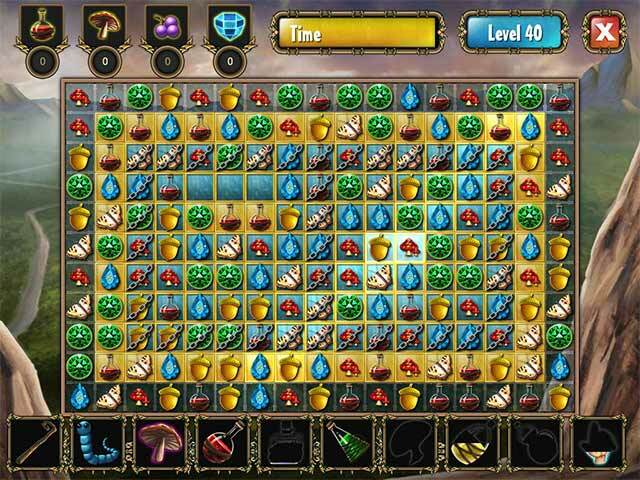 Rebuild it by unlocking the mysterious ingredients you need in exciting match-3 levels!